2 Corinthians 8:9 “For you know the grace of our Lord Jesus Christ, that though he was rich, yet for your sake, he became poor, so that you by his poverty might become rich”. The exchange is clear: from poverty to riches. Jesus became poor that we in return might be rich. When did Jesus become poor? 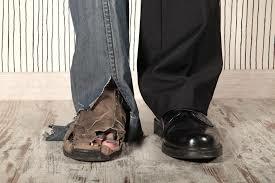 Surely, He was not poor throughout His earthly ministry. Any man who can provide food for a crowd of 5000 men along with women and children cannot be poor! Jesus did not have a large bank account, but He certainly had an abundance when the need arose. He may not have carried money in his purse, but he surely knew where the money was and how to get it! At no time did He lack anything. So, when did Jesus become poor for our sake? The answer is: on the Cross. In Deuteronomy 28:48 Moses summed up absolute poverty in four expressions: hunger, thirst, nakedness and in need of everything. Jesus experienced all this in its fullness on the cross. He was hungry. He had not eaten for nearly 24 hours. He was naked. The Roman soldiers had stripped him of all His clothing and divided it among themselves (John 19:23,24). He was in need of all things. He no longer owned anything. After His death, He was buried in a borrowed robe and in a borrowed tomb (Luke 23:53). Thus, Jesus exactly and completely endured absolute poverty for our sake that we might partake of his riches! Dear Lord, we pray for Your blessing to fall upon each of us. We pray that Your favor will rest us and our family. We pray for our financial needs as well as those of Your church. We thank You for answering our prayer. In the Name of Jesus, Amen.